On January 14, Homeschool Ways will give away a signed copy of the New York Times bestseller “The 12-Week Year” to one lucky email subscriber. 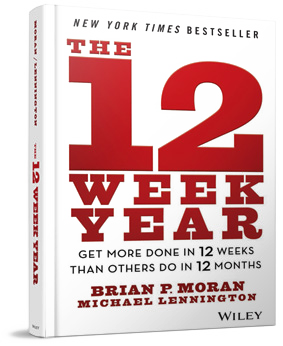 “The 12-Week Year” has helped me replace self-defeating new year resolutions with achievable planning solutions. The authors, Brian Moran and Michael Lennington, have taken a concept from sports, called periodization, and applied it to goals and productivity. By thinking about four “year ends” instead of one, you will get a lot more done. Whether you need to learn how to get things done more efficiently in your home, homeschool, business or career, this book delivers. For a more in-depth review of the book, please check out my newspaper column about it. The authors also offer a free course based on the book. To enter the giveaway, you must be an email subscriber to Homeschool Ways. If you are already subscribed to our weekly email bulletin, you are automatically entered. If you are not subscribed, click here to be directed to a sign-up form. When you sign up, as a bonus, you will receive my 34-page ebook, “21 Days to Jumpstart Your Homeschool.” You’re welcome! Homeschool Ways sends out a weekly email bulletin with homeschooling information not available on the blog. Godspeed in your homeschool in 2014!